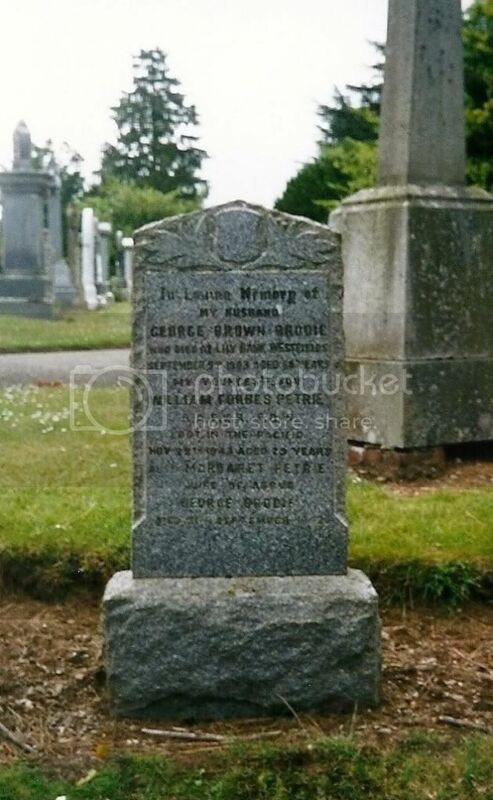 This Brodie headstone stands in the Blairgowrie Cemetery, Blairgowrie, Perthshire. It's not a great photograph - I shall get a digital image taken, the next time I come north of the border. This is the Uncle Willie I never knew. He was brother to Alexander Brown Brodie (Ali), George Brodie (my father), Robert Forbes Petrie Brodie (Bob) and Annie Forbes Petrie Brodie (Mrs. James Wallace). He was Uncle to Don; Ali; Effie; Eric; Dorothy; Isla; Ian; Heather; Moira; and Rona.